Corbett National park was established in 1936 as Hailey National park which later renamed as Corbett National park after the name of Sir Edward James Corbett, the noted tiger hunter who turned as a conservationist of the area. Today Corbett National park has the total area of more than 1200 sq km spreading over three districts Nainital, Pauri & Almora of Uttarakhand. It is geographically located between Shivalik Himalayas and the Terai. This park is famous for Royal Bengal Tiger & Asiatic Elephant. Addition to these, park has over 550 species of Birds and declared as Important Bird Area by Birdlife International. Corbett Tiger reserve formed after combining of neighboring Sonanadi wildlife sanctuary with corbett national park. Corbett Tiger Reserve provides Day visit as well as night stay inside the park. These booking can be booked online. For Indian national booking opens 45 days in advance. 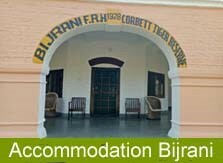 For foreigner booking opens 90 days in advance for accommodation in Corbett Tiger Reserve. Following are the Forest Rest houses are available for visitors. Dhikala & Gairal have Canteen as well as dormitory facilities. Sarpduli FRH only has dormitory available for visitors. Visitors can book max 03 nights accommodation inside the park. For day visit to these tiger zones visitor can booked morning and afternoon safari as per their choice and as per availability. Bijrani: Bijrani is one of the prominent zones of the Corbett Tiger Reserve. There are Government forest rest houses inside the zone that permits night stay in the lap of nature. The area in and the Bijrani was once dedicated to shooting block during the British period. The area was much loved by the Shikaris as it offered quality of game hunting. Sultan Forest Rest House (02 dbl rooms): If we head towards Dhikala from Dhangarhi gate, Sultan is the first Forest Rest House we come across. This rest house is named after the seasonal stream running through that area called Sultan sot. It typifies the dense forest area of pure saal that occupy in the park. Gairal Forest House (04 dbl rooms & 06 Dormitory) This rest house can be accessed by a short detour of the Dhangarhi-Dhikala main forest road. 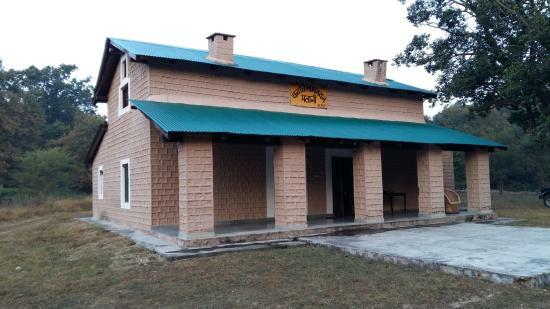 The prime attraction of this rest house is that it lies on the banks of River Ramganga. Tourists staying here can experience crystal clear, fast flowing mountain river running through the scenic forests. Situated in the lap of the nature Gairal presents ideal condition for nature watch and wildlife viewing. Sarapduli Forest House (03 dormitory only) Another forest rest house inside Dhikala zone is Sarapduli that is located downstream of Gairal on the flat southern bank of the Ramganga. It is preferred by wildlife lover as here one can spot movements of large mammals including tiger and elephants. It is also perfect place to watch crocodiles and birdlife viewing. Khinnanauli Forest House Strategically located amid the Khinnanauli Chuar, this wonderful forest rest house is an excellent tiger territory. It has been developed recently in order to promote easy tourism to the various parts of the park. This forest house is not available for tourists. Dhikala Forest House (12 dormitory) Dhikala forest rest house needs not much introduction if we talk about wildlife tourism in Corbett. This well-known tourist destination is located at the edge of Patli Dun valley through which River Ramganga flows in numerous channels. Dhikala is an easy gateway to the various part of the park. The place offers panoramic view of the valley with the Kanda ridge in backdrop. The old Forest Rest House at Dhikala is a historic structure, built over a hundred years ago.